Australia decided to bat first for the third successive time in this series, hoping to replicate their last game performance as they brought in James Faulkner in place of the sick Kane Richardson. India, on the other hand, brought back the successful pace combination of Bhuvneshwar Kumar and Jasprit Bumrah by benching Umesh Yadav and Mohammad Shami, and Kuldeep Yadav replaced Yuzvendra Chahal. India kept things tight from the start with Bhuvneshwar and Bumrah hardly giving any breathing space to the Australian openers. The first boundary came as late as in the fourth over when Bumrah was hit for two fours by Aaron Finch and they could only make 60 runs in the first 10 overs. The frustrating run rate was further compounded for the Aussies when Virat Kohli introduced Hardik Pandya to the attack and Finch’s hasty nature saw his lofted drive in Pandya’s good length ball reach the hands of Bumrah at mid-off, who fumbled initially before getting it clean. Dealing mostly in singles, Australia reached 94 runs in the 18th over when Axar Patel was introduced and his opening over of four runs forced Steve Smith to go for the big shot and it backfired instantly as he failed to sweep a Kedar Jadhav ball and was caught plumb in front with Australia at 100 for 2 after 20 overs. Warner, who had just completed his 50, was next to follow suit when his mishit from Patel’s delivery carried further than he had planned and Manish Pandey caught it at long-on in the 23rd over. New batsman Peter Handscomb and Travis Head were clearly struggling against the spinners and Patel got Handscomb’s wicket leaving Australia with 119/4 in 25 overs. With much of the top order returning to the pavilion, Australia weren’t aiming for a mammoth target anymore and that it was evidenced by the approach of Stoinis and Head, who were dealing mostly through singles. The duo added 87 runs in the next 18 overs with just nine boundaries between them. Kohli’s reintroduction of Bumrah and Kuldeep remained ineffective and it needed Patel’s brilliance to get the next breakthrough in the 43rd over. The slow run rate forced Head to innovate against the attacking field with a sweep shot but realized he isn’t in a position to do so as Patel’s delivery with a sharp dip found him helpless and consequently bowled. With spinners pretty much ruling the day so far, Bumrah produced a magnificent in-cutter that Stoinis failed to read and was caught on his pads. Australia were 234-6 in the 48th over when the impatient Matthew Wade failed to get under Bumrah’s low full-toss and his airy slice was caught by Rahane. Bhuvneshwar capped off the things with a brilliant spell giving only five runs in the last over as Australia finished 242-9 in 50 overs. Australia started their run chase positively as Pat Cummins had an LBW appeal turned down right on the first ball. With run-rate lesser than five, openers Rohit and Rahane took time to settle and though Rahane occasionally opened his hands, Rohit’s first runs came after 14 deliveries when he hit two back-to-back boundaries off Cummins. India reached the 10th over with 43 runs on the board. With Stoinis, Faulkner, Cummins and Nathan Coulter-Nile all failing to break the ice, Smith introduced Adam Zampa and Travis Head after the 10th over. It helped little as the batting duo kept rotating strikes and by the end of the 13th over, India’s total reached 65/0. After the drinks break, Rohit looked determined to clear the boundaries hitting Head for a six and a four, bringing his 35th half-century in the 19th over and third 100+ consecutive opening stand in this series. Rahane followed suit next over, walking down to Faulkner’s delivery and smashing it for four, thus bringing up his fourth consecutive half-century, thus quashing a lot of talks surrounding his limited-overs batting prowess. Just as the pair looked unbreakable, a slow Coulter-Nile delivery caught Rahane (61) on the pads, reducing India to 124-1. Skipper Virat Kohli came in next hoping to take India all the way this time and India stood at a decent 135-1 at the midway mark of the innings. 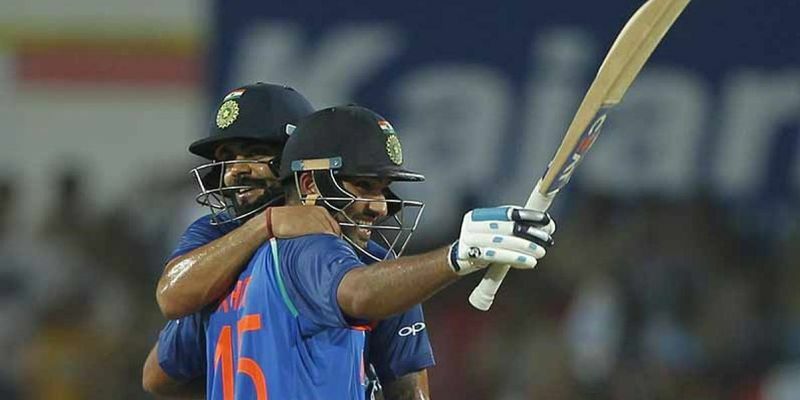 With just 108 runs remaining of the next 25 overs, both Kohli and Sharma had little concern about the run rate, and some clever doubles and singles also eased off the pressure that previous game’s run-out had hanging over their head and India brought up their 150 runs in the 28th over. Sharma’s slight hamstring further reduced the scope of singles and he had to resort to big shots as India saw its first boundary in seven overs when Rohit hit Head for a six in the 33rd over and soon brought up his 6000 ODI runs. The next big hit came in the 35th over as Rohit dispatched Coulter-Nile over mid-wicket for a giant six to bring up his 14th ODI hundred and sixth against Australia. However, he couldn’t see India off the finish line as his exhaustive shot at 125 ,was caught by Coulter-Nile off Zampa’s delivery. Kohli followed suit three balls later as his favourite inside-out lofted drive was caught by Stoinis at long-off. However, it was too late to affect the outcome as Jadhav and Manish Pandey peddled India home with seven wickets and seven overs remaining. With the victory, India also returns to World No. 1 in ODI rankings.